After moving to a small town, Zach Cooper finds a silver lining when he meets next-door neighbour Hannah, the daughter of best-selling Goosebumps series author R.L. Stine. Stine is very mysterious and a prisoner of his own imagination - the monsters that his books made famous are real, and he projects his readers by keeping them locked up in their manuscripts. When the monsters are accidentally unleashed and begin to terrorize the town,..
Own Goosebumps - Chillogy DVD from Deff, DVD, Blu-Ray & 4K Video Specialists - Free UK Delivery..
R.L. Stine's best-sellings book series comes to life in Goosebumps: The Complete Collection, containing all 68 terrifying episodes of the classic kids horror show. Full of werewolves, ghosts, haunted houses and plenty of creepy crawlies, the series - which was heavily censored prior to its original broadcast on CBBC - has gone on to gain cult status amongst the kids that it frightened in the 90s. All four series of the hit show come tog..
Be careful what you wish for. With their after school junk business, best friends Sonny and Sam hope to find treasure in other people’s trash. 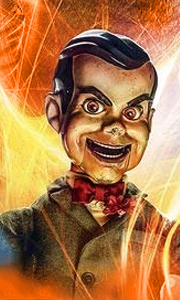 But when cleaning out the old Stine house, they open a locked book that frees a supernatural nightmare – Slappy! Now, with the help of Sonny’s sister Sarah, they’re in a race against time to get the sinister dummy and all the creatures he’s brought to life back into the pages before he unleashes ..
After moving to a small town, Zach Cooper finds a silver lining when he meets next door neighbor Hannah, the daughter of bestselling Goosebumps series author R.L. Stine. Stine is very mysterious and a prisoner of his own imagination – the monsters that his books made famous are real, and he protects his readers by keeping them locked up in their manuscripts. When the monsters are accidentally unleashed and begin to terrorize the town, i..
Own Goosebumps Seasons 3 to 4 DVD from Deff, DVD, Blu-Ray & 4K Video Specialists - Free UK Delivery.. Double bill of adventures based on the 'Goosebumps' books by R. L. Stine. In 'Goosebumps' (2015), when teenage loner Zach Cooper (Dylan Minnette) finds himself friendless in a new town after his parents make him move, he is pleased to discover a beautiful girl living next door. As Zach makes friends with the neighbourly Hannah (Odeya Rush), he learns that her father is R. L. Stine (Jack Black), the author of the 'Goosebumps' books. When..